Virgin Voyages announced today that the Scarlet Lady will have a tattoo studio aboard, Squid Ink. The venue will also offer body piercing. Virgin Voyages teamed up with the ink industry gurus from World Famous Tattoo Ink, according to a statement. 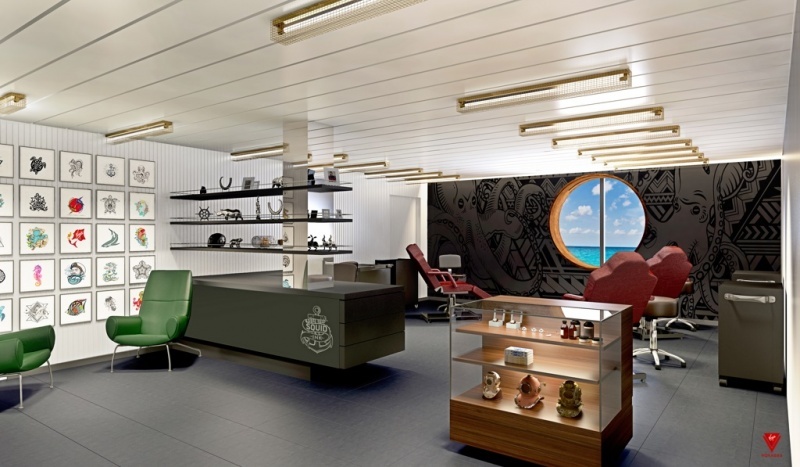 When Virgin Voyages’ Scarlet Lady sets sail in 2020 from Miami, she will have two full time resident tattoo artists on board, handpicked by ink industry guru Lou Rubino Jr., the company said. Squid Ink will also feature a line-up of guest artists including the "tattoo industry’s most sought-after trendsetters and celebrity artists," Virgin said. All tattoos will be created with original vegan ink, according to Virgin. In addition to tattoos, Squid Ink will also offer body piercings as well as permanent makeup treatments using vegan-friendly Perma Blend pigments.